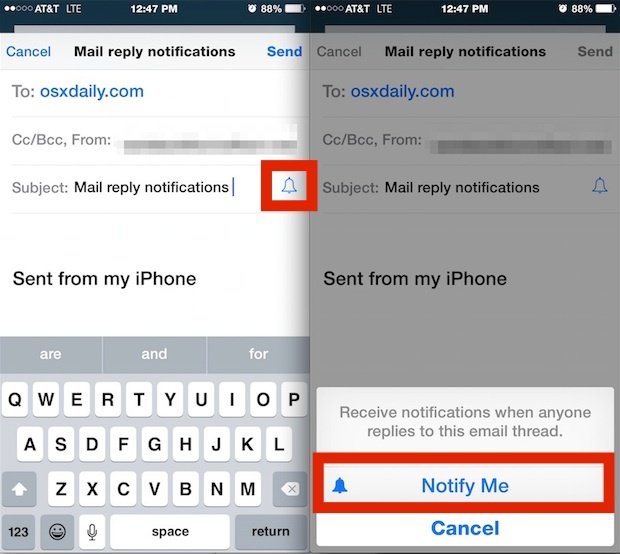 The iOS Mail app has long included a variety of ways to be notified of new emails, whether it’s the standard notification for all new messages, or having a unique alert set to specific VIP contacts. Perhaps even better is a feature added to recent versions of iOS that allow for individual email thread alerts, meaning you can be notified when a single designated email conversation gets a reply from any of the recipients. These email conversation alerts can be enabled in a new mail composition, a reply, or a forward. You’ll need iOS 8 or newer on any iPhone, iPad, or iPod touch to have this great feature available to you, though it does not matter if others in the email conversation have a recent version of iOS let alone an iPhone. At the moment, email thread notifications are not available in the Mac Mail app of OS X, though a reply sent from a Mac will still trigger the individual thread alert. 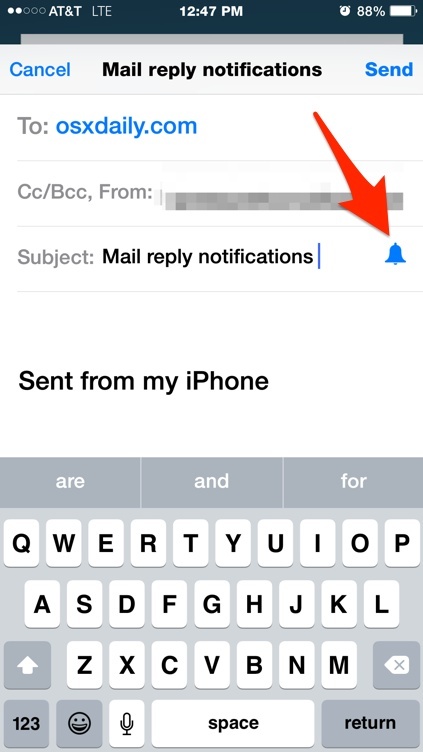 Now when you get a response from anyone in that email thread, you will get a notification from the Mail app indicating a response to that specific email. This is a really great way to keep track of an important email conversation that is time sensitive or just otherwise important for whatever reason. 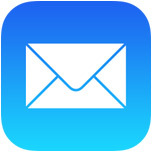 Any email responses to that thread will now have a filled blue bell icon in the subject, indicating that notifications will arrive for that thread. This means that even if an existing email conversation has been going on for quite some time, you can choose to elevate it’s alert level at any time during a reply if you deem necessary. You can disable the specific email thread notification by tapping on the Blue Bell icon again, which will become just a blue outline as the default option. If you’re regularly overwhelmed by tons and tons of email (and who isn’t? ), this feature can be used in conjunction with VIP contact lists and unique alert sounds to help make particularly important messages and senders visible in the ocean of never-ending email noise. Enjoy this Mail tip? We have many more Mail app tips, take a look. I believe this feature is only for iCloud email accounts. WHAT little blue bell icon? That never shows up in Mail.app. Yosemite, all apps updated. Mail is listed as an app to show notifications. How can I see if someone in a thread as had notifications of me forwarding and email they were the author of and I was a recipient in this thread and that they read the comment I forwarded to someone not in the thread . A breach of my privacy I didn’t sent to anyone but 2 others not in the thread and only made a comment to one of these contacts ? I see bell on iPad and iPhone mail but not on my mac which is updated to Yosemite. What should I do? Well “I” for one found this info bloody invaluable and wish I’d looked it up a hell of a lot sooner. Dunno about ‘Quacks’ comment though, I’m not suprised there wasn’t alota feedback on that one. Read it 3 times and still couldn’t figure out who’d emailed who and who’d replied to what – too much of a brain teaser for my tiny brain I’m afraid – and before you even think about it Quack I’ve thought it for you luv. Yes I can put my hands up high to knowing about as much as you when it comes to smart phone useage- Jack Squat but ‘Man’ you don’t make it easy for some poor smuck trying to offer words of wisdom to the ‘smart phone illiterate ! !’ Any way – to all the computer savvy smart saviours out there it’s a big ‘Thanks heaps my friends’ from me. Without you buggers over 50 somethings like me would be totally screwed and still using a 2005 model Nokia. Cheers !! This all works fine, but how can I cancel the notification subscription for a thread where I no longer have any related message? If I’ve deleted all the messages I can’t unsubscribe. If I then do receive a message on the same thread (which of course I may never receive) then I can unsubscribe but not otherwise. It looks like the Mail settings screen is different depending on whether there are any threads subscribed for notifications or not, but it doesn’t let me see any list of threads or let me reset these. So I am extremely wary of using this feature in case I end up with my phone waiting forever for a mail nobody ever sends!